Characteristic: Easy-to-make with rich and amazing delicious Thai tea flavour. Ingredients: Sugar, Non-Dairy Creamer (Glucose, Palm Oil, Sodium Caseinate (Milk)), Thickener (E1422), Coconut Milk Powder (Coconut, Glucose Syrup, Sodium Caseinate (Milk)), Instant Tea Mix (Tea Extract, Flavouring, Maltodextrin (Maize), Colour (E110)), Salt. 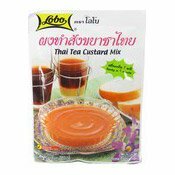 Simply enter your details below and we will send you an e-mail when “Thai Tea Custard Powder Mix (泰國奶茶味凍粉)” is back in stock!